Why can't I hear any audio out of my Control Room output on the StudioLive AR Mixer? 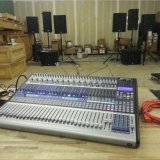 Why can't I hear any audio out of my Control Room (CR) Audio Output on a StudioLive AR Mixer? When PFL or AFL is engaged anywhere, the Control Room and Phones switch to the Solo bus, so you'd only hear what's there. If you PFL/AFL'd something with no signal, or if the Solo volume is down, you won't hear anything. If an AR mixer is reported as no audio from Control Room or Phones, it likely has no audio from either, because there's a PFL or AFL button depressed without realizing it. Can I record to an iPad with a StudioLive AR Series Mixer? Should the Main meters on the StudioLive AR mixer switch to show pre-fader metering for the PFL soloed channel?" Studio live AR 8 hiss on sd recordings playback! Why is my StudioLive AR mixer's SD recording noisy? StudioLive AR hybrid mixers - Can they simultaneously record multiple tracks at once into the DAW through the USB port? Why can't I hear an XLR condenser mic through the control room outputs and headphone output when not using the mains?